Ah, lunch, one of my favorite parts of the day. Living five minutes from a Mr. Dunderbak's certainly has its perks. I called a friend this afternoon and had her meet me for some excellent German food. Besides, I had been craving German foods since going to our local Oktoberfest a couple of weekends ago. I think a trip to German during their Oktoberfest is in my future...at some point. Even though the menu is pretty extensive, featuring platters, sandwiches, soups, salads, and a list of sides, I had already perused the menu online and knew exactly what I wanted. 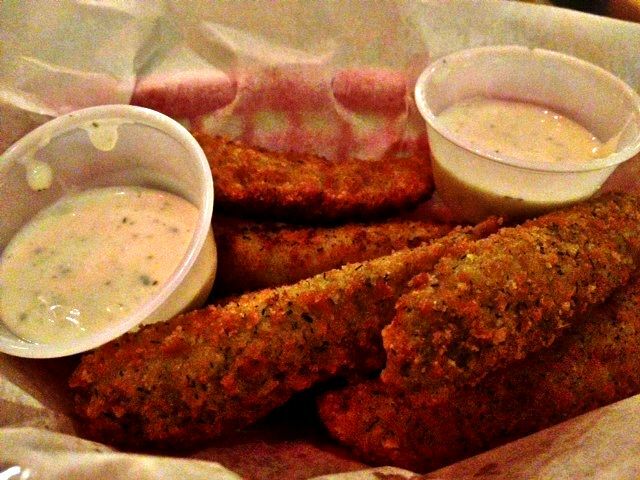 As an appetizer, we settled on splitting the deep fried pickles. These pickles were the perfect mix of breading and spices. I love dill pickles, but tend to detest the actual dill herb. But, having tons of dill in the breading didn't deter me from these lovelies. In fact, it enhanced the flavor of the pickle even more, wasn't overly done at all, and matched perfectly with the ranch dressing for dipping. We ate these without even pausing to let them cool down. You know when you eat something really hot and then you attempt to chew and blow hot steam out of your month, all at the same time? Yeah, that was us. Next, we ordered our main meal. I decided on the Schnitzel Sandwich (Pork) with a side of Garlic & Herb Pan-Fried Potatoes and my friend Jackie ordered the Schnitzel Salat (Pork). The Schnitzel Sandwich is a pork cutlet lightly breaded and topped with lettuce, tomato, and mayo, set on a kaiser roll. The Sandwiches are typically served with potato chips and a pickle spear. Piled high with pork cutlets, the Schnitzel sandwich is pretty large. For only $7.99, I'd say it's quite the bargain. Just like with the pickles, the breading on the pork is perfect, non-greasy, and pairs well with the other parts of the sandwich. The Pork Schnitzel Salat: crisp greens, cucumber, carrots, red cabbage and tomatoes, topped with breaded pork cutlet. I think I'll get this next time! In addition to their delicious meals, Mr. Dunderbak's is known for their beer. They are the only German-American beer bar in Tampa, and have been for the past 40 years. They have 55 draft beers and over 400 beers in the bottle. As you can probably tell, Mr. Dunderbak's has shirts, candy, cookies and their marketplace (pictured) sells cheeses and meats traditionally from Europe. Also for purchase are steins, glassware, and homebrewing kits. From Thursday-Saturday, live German and American music from local bands can be enjoyed during dinner. Especially with the nice weather we are having, spend your meal sitting in the handful of tables they have set outside and enjoy!